I mentioned before that the 17th of Tamuz marks the beginning of a period of symbolic mourning for the destruction of the Temples in Jerusalem. Practically speaking, what this means is that we observe the same customs of symbolic mourning that we do during the first 33 days of the Omer: we don’t attend live concerts (and have varying customs on what kind of music we listen to), don’t buy new clothes, and don’t get haircuts (and men don’t shave their beards). In Hebrew, the period of the Three Weeks is called “Bein HaMetzarim.” This is could be cleverly translated into English as, “Between the Dire Straits.” (Since you are not a native English speaker, I want to make sure you understand this: “Meitzar” is both a “strait”, as in a channel connecting two bodies of water, and a flowery Biblical word for trouble or distress. “Dire straits” is an English expression that means “very serious trouble.” Google translates the phrase into Catalan as “dificultats.” Sounds like an understatement to me….) The Sages teach that this is a period during which “the Prosecutor speaks against us” (as in Satan; see my section on the Jewish concept of Satan in The Vagueries of the Jewish Afterlife), meaning that God judges us more harshly. So we try to kind of “lay low” during this period, avoiding important business interactions or other endeavors that require Divine assistance. From the first day of the month of Av (or if you’re Sephardi–which, um, I guess you are! :P–from the Saturday night before Tisha B’Av), the symbolic mourning intensifies. Ashkenazim call this period “the Nine Days.” Sephardim call it, “hashavua sheḥal bo,” “the Week on Which It Falls.” We no longer bathe for pleasure or wash our clothes (unless it’s necessary for hygienic purposes), and we don’t eat meat or drink wine. (I guess you Catholics might call that “fasting.” 😛 ) We also do not build houses or move into new homes during this period. “Tisha B’Av” means the Ninth of Av, and it is the saddest day in the Jewish year. On this day, the First Temple was destroyed by the Babylonians, and then, by Divine poetry (or bizarre coincidence, for those who believe in such things), the Second Temple was destroyed by the Romans on the same date several hundred years later. It so happens that a number of other great calamities befell the Jews on this day on the Hebrew calendar, and during this period in general. The last Jew left the shores of Spain on Tisha B’Av in 1492. 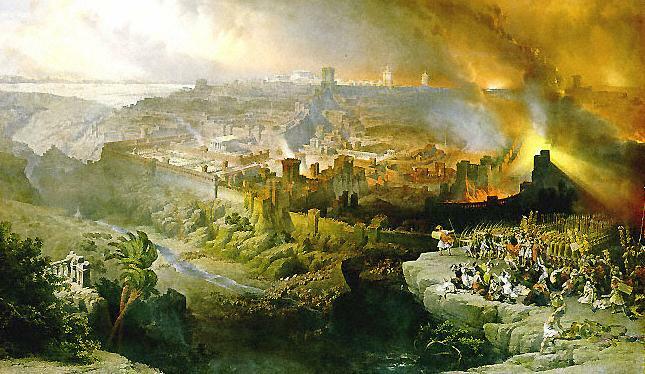 A number of disasters connected to failed attempts to restore Jewish sovereignty over Judea after the destruction of the Temple also happened on Tisha B’Av. So, too, with a number of critical events during the Holocaust. Heck, just last year, I was rudely awakened on the morning of Tisha B’Av by an air raid siren… :-/ Like I said. Not a good time for the Jews. So as I elaborated in my letter about Jewish fasts, Tisha B’Av is a major fast day, meaning that we refrain from eating, drinking, washing for pleasure, wearing leather shoes, anointing ourselves with oil, and sexual relations, from sundown to nightfall the next day. We also sit on low stools, like mourners sitting shiva, for the first part of Tisha B’Av (until midday, at which point the Temple had already been destroyed); nor do we greet each other, because we are not allowed to greet mourners, and we are all mourning on this day. 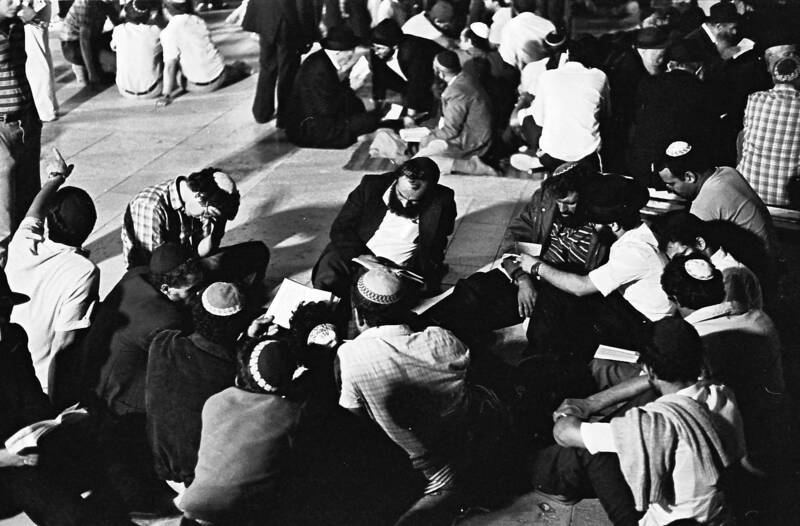 On the evening of Tisha B’Av, after the usual evening prayer service, the book of Eikha (Lamentations) is read in the synagogue while everybody sits on the floor. It was written by Jeremiah the Prophet and describes the desolation in Jerusalem after its conquest by Nebuchadnezzar. Then a series of Kinnot (poetic lamentations) are read. Listening to Lamentations on Tisha B’Av evening at the Kotel. First of all, before you can understand why the destruction of the Temple was such a big deal, you have to understand why the Temple was such a big deal. I elaborate on this in my letter about the history and significance of the Holy Temple in Jerusalem, so if you haven’t read that one yet, now is the time to do that. When God gave us the Torah, He had a vision for us. He would be our God, and we would be His people. The Holy Temple would serve as a meeting place between humanity and the Divine, not only for the Jewish people, but for the world in general. We were to serve as a model nation, showing the world what a society could look like if it follows God’s word. We were to be a “light unto the nations;” to spread morality and knowledge of God throughout the world. God promised us that if we kept His commandments and stayed loyal to Him, He would bless us and protect us, and make us a “nation of priests.” A majority of the book of Deuteronomy is a speech that Moses gives the nation of Israel in which he goes over the commandments again, along with God’s promise. But, God said, if we failed to keep the commandments, and strayed to worship other gods, He would curse us, and send us scattered from the land. Basically, God presented us with an Ultimate Plan for the Redemption of the Universe. The plan was, we inhabit the land and set up a model kingdom right in the heart of the world, on the crossroads between Asia, Africa and Europe, where most world civilizations would have the chance to come in contact with us, and thus influence them to give up idolatry and immorality and embrace God and Godliness. Unfortunately, we failed to create this model society. We succumbed to the temptations to be like other nations, to serve other gods, including our own “evil inclinations”, and eventually God had to fulfill His promise: He destroyed our kingdom and our Temple. We lost our direct connection to Him. According to Judaism, there has been no prophesy since the destruction of the First Temple. The last of our prophets was Malachi. The rest… I’m going to step my current self aside and give my 20-year-old self the stage. This is an excerpt from a ridiculously long letter I wrote to you eight years ago on Tisha B’Av, July 24th, 2007. So you see… it’s not really the destruction of a building I’m mourning as I sit here close to the floor with my face unwashed and my stomach empty. It’s the destruction of a certain kind of relationship. When we were in this land with our Temple, we were so close to God. We were living as a “light unto the nations”, a kingdom to shine as an example to the nations of the world and let them see how a fair and just society can look like. But we blew it. My eyes fill with tears as I write this. We blew it. We failed. We broke the covenant. And God could not let us live here, together, any longer. He had to disperse us among the nations, where we would be hated and persecuted for two thousand years. Where we would be massacred and expelled and tortured and ridiculed throughout the centuries. Don’t you see? The destruction of the Temple is the root of all Jewish suffering. If we hadn’t ruined it, if we hadn’t been so stupid, none of that would have been necessary to teach our lessons to the world! We wouldn’t have needed to suffer so much to spread our ideas! All of it, all those coincidences on Tisha B’Av, and all those massacres during the Crusades, and the Spanish Inquisition, and the expulsions from everywhere, and the pogroms, and the Holocaust–all of it was part of the Divine Plan B, implemented after we messed up Plan A. So what now? It seems that God is knocking on our door again, by some miracle giving us back the Promised Land and Jerusalem… but again, the world is poised against us. Will we mess it up again? Or will we somehow succeed in taking this chance to reestablish that role we’ve been missing for 2,000 years? Right now I feel the urgency of this question as our government and our society slide downhill. God doesn’t need a Jewish people in its land with leaders who lie and cheat and sexually abuse.1 He doesn’t need a Jewish people in its land selfish and divided. I do believe, with all my heart, that bringing us back to Israel was the beginning of the process of redemption… but I’m so afraid of the shaky ground on which we stand. What if He has to destroy this process and go through it all over again? So we fast and we pray and we hope that we are strong enough, that we are ready to be what He wanted us to be. The whole purpose of the Jewish faith is to hone us into a model society, one that is loving and helpful to all others, that supports those who need support, that trusts in the One God and believes only in Him. On Tisha B’Av we long to become that society… without more suffering. Without more slaughter and bloodshed and hatred. We mourn the days that we had the chance to be that way, and we pray for a second chance in the days to come. And that, my dear friend, is the meaning of Tisha B’Av.